This year we completed over 100 weddings, which was a true marathon. I’m very happy I was able to concentrate on growing a lot of focal flowers – implementing part of what I learned from 2017. I planted big beds of lisianthus and dahlias, plus many a zinnia. In spring, of course, we had anemones and ranunculus, along with tulips, daffodils, and peonies. While I didn’t conduct a thorough, standardized evaluation of every variety, I do have some impressions of what worked best for us and what I fell in love with just for its color, form, or general magic. Enjoy. Ranunculus in the hoop mid-May. ‘La Belle Champagne’ on the left, ‘Gigi White’ on the right. Image ©Nelson Esseveld. This year I sourced all my corms from Gloeckner. I considered getting some Italian ranunculus from Onings, but they are really exorbitantly priced. From about 1,200 plants, we harvested 5,510 stems, putting us just under 5 stems per plant. This is a bit low — I was hoping for at least 6 — but considering they were blooming for under 4 weeks this year, I’m very happy with that production. Because of our incredibly hot June, plants fizzled out earlier than I’d hoped. But of course, they still last forever in the cooler! Check out my post from 2017 to see how we grow ranunculus. La Belle Gold: A standout for us this year. It’s the most perfect not-lemon not-mustard color of yellow, and really makes spring palettes pop. My designers said that it made their designs snap into focus. Gigi White: A new series to us, Gigi had BIG beautiful pure white blooms that started about 2 weeks later than the La Belles and Amandines. Unfortunately, that meant they bloomed for a very short period, because our spring was so unseasonably hot. But I would absolutely grow them again for their big immaculate flowers. La Belle Champagne: Probably the best ranunculus I’ve grown for color. It has subtle variations, from pink to apricot to salmon, and every bloom is stunning. If I had a jillion hoop houses, one of them would be filled with only this. Amandine Pastel Mix: Lots of fun picotees and weirdos in this mix. I really enjoyed growing it! Amandine Marshmallow: I haven’t tried La Belle Pastel Pink, but this one was the closest to blush ranunculus I’ve grown, without going the expensive Cloni route. Very useful. Clockwise from top right: ‘Amandine Yellow’, ‘La Belle White’, ‘Amandine Marshmallow’, ‘La Belle Violet’, ‘Amandine Bonbon’, ‘La Belle Dark Orange’, ‘Amandine Orange’, ‘La Belle Gold’, with ‘La Belle Champagne’ in the center. A lovely mix including ‘La Belle Gold’, ‘Amandine Orange’, and some ‘Amandine Bonbon’. Image ©Nelson Esseveld. A super-fun June bouquet featuring ranunculus and lilies. Image ©Nelson Esseveld. ‘La Belle Champagne’ front & center. Voyage Series: We planted ‘Pure White’ and ‘Light Apricot’ from Farmer Bailey plugs (so excited to see that they are offering perennial plugs now!). These went into the hoop house at 6x6” on March 23rd and began producing around August 1st. I gave them a pinch after my friends Calvin & Julie at Arrowhead Dahlias said that’s what works best for them – just snipped out the top couple of nodes when they were about 6” tall. They were absolutely fantastic – such fluffy, dramatic blooms, turning lissies into a focal flower. The apricot was particularly flouncy and beautiful. They were productive for about 6 weeks and gave me a second flush early in October, but the stems were pretty weak. I think if I’d cut them back really hard first cut they would have done better. We planted our other lisianthus varieties outside in a caterpillar tunnel, and they were not so happy. They still produced well, but seemed to take forever, and we had a lot of die-off. I’m not sure if this was because of planting techniques, clogged drip emitters, or what, but nearly one full side of the bed died or made very short plants. The plugs we planted in our upper field, without a tunnel, did even worse (not helped by the fact that they didn’t have netting on). Though we eventually got decent stem lengths outdoors, I need to figure out a better system. I know that other growers in our area, like Kim at CityGal Farms, get excellent stems from outdoor lisianthus. Anyone want to comment on this? Arena Gold: Gorgeous buttery color, though not much in demand this year. Dear Pantone, please make yellow a thing for 2020. Arena Red: Alas, this was replaced on my order by something called Advantage Cherry Sorbet, which was bleeeeccchhh outside. It spotted easily, was very short, and it’s kind of a weird color but not in a good way. Hoping to get Arena Red in the future, since it’s such a unique color. Echo Lavender: Gorgeous color, though I think it was among the shortest of everything I grew, and more susceptible to being eaten by bugs. When I have my 12 lisianthus hoop houses, this will fill one of them. Mariachi Misty Pink: A really nice pink, though it was a bit too bright for what I wanted. I know folks really like Corelli Light Pink for its blushy color, and I’d love to give that one a try. Mariachi Pure White: Totally acceptable white but nothing out of this world. Roseanne Brown: Ok, I was skeptical at first, but this variety really is worth growing for those of you with a market in moody, weird palettes. It’s a striking flower, smaller-headed than most other series, but with truly lovely color variations. The stems are quite good. I’d love to hear about your experiences with Dark Brown and Black Pearl. ‘Voyage White’ lisianthus making a statement in this saturated, glorious bouquet. Image ©Mallory Munson. I know everyone has probably done most of their dahlia shopping, but just thought I’d give some insight into the ones that I loved this year. Except for ‘Silver Years,’ these are all sold out in my shop. We potted up dahlias for cuttings in March and planted out unsprouted tubers about 2 weeks before last frost. We use two rows, 18” apart, plants spaced 12” apart in the row, and a corral of t-posts and twine to hold them in. I pinch plants when they are a foot high, taking out the top 2 nodes, or whatever feels right for that plant. They’re pretty tough, so even if you chop out a lot of the plant, they still thrive. Hillcrest Amour: My absolute favorite this year. I got this from Arrowhead Dahlias and it was stunning – a big, bountiful white that threw long stems like a champ. It has a light lavender or blush at the very center, so it’s not pure white, but I think that makes it even more beautiful. Who has a lovely productive white dahlia? I know some folks really like Blizzard and Boom Boom White, but I haven’t grown either of these. Bracken Sarah: Oof, what a heartbreaker. I know yellow isn’t an “in” color right now, but this variety is just too good to be true. Creamy, buttery, cantaloupe-y… and BIG, dramatic blooms. I had only one plant, so I’m not sure of its productivity, but it seemed to push out plenty of stems for the size of its flowers. Sorry, no pic. Intrigue: An informal decorative with a great form and thick petals that are easy to work with. The watermelon color is just stunning and seems to have flecks of gold or maybe glitter embedded in it. Great stems, and I wish I’d planted more. Hollyhill Black Beauty: If you haven’t grown this one, just do it. It’s a semi-cactus, which adds an extra dimension of texture to a design, plus it’s the perfect dark burgundy-almost-black that a lot of moody palettes require. It’s so beautiful that when I was trying to photograph it for my tuber shop, the camera couldn’t capture its true color. I had to do some tweaking to make it look right. It’s really productive and one of the best burgundies you can grow, if it doesn’t have to be a ball dahlia. I truly love every bloom. Silver Years: The sleeper hit of the season, ‘Silver Years’ was a replacement from a wholesaler for ‘Sweet Nathalie’, but I’m so glad I got it! It’s a waterlily form, which I find beguiling and feminine, and it really is the perfect shade of blush. Plus, it’s much more productive than ‘Sweet Nathalie,’ and doesn’t have that unfortunate habit of facing downward, like it has its chin tucked in. Nope, ‘Silver Years’ is ready for its closeup. Highly recommended. Find it in the shop HERE. A kind of crappy picture of a really beautiful November compote filled with mums: ‘Lavender Pixie’, ‘Shock’, ‘Coral Charm’, ‘Apricot Alexis’, ‘Obsession’, ‘Savannah Charlton,’ ‘Alexis’, ‘Moonbeam’, ‘Norton Vic’. This year’s mums were exponentially better than last’s, but still in need of attention and improvement. I gave them netting this year, thank goodness, but it really is true that they can use 2 layers – the blooms are SO top-heavy and the stems do, in fact, need that much support. This year I took my overwintered mums out of storage in early March, but I could have done it much earlier, say end of January. I potted them up and got them watered and they started putting on growth immediately. I also got my rooted cuttings from King’s Mums around this time. I think I had my mums growing too closely in the nursery, or under not enough light. They got quite leggy and had a frightening aphid episode, which I treated with pyrethrin because I wasn’t about to have aphids in my nursery. I started taking cuttings and waiting around for the ranunculus and anemones to move out of the hoop house so I could get the mums planted. By the time that happened, my mother stock was TRULY leggy, and I didn’t cut them back hard enough. The stems were weak and a bit squirrely at the base, so we had quite a time getting them to come up through the netting. But in they went, around June 15, at 12x12”, and by mid-September the early varieties were blooming, while blooming lasted through mid-November. They’d probably go a bit longer but we stopped watering them and it did start to get quite cold. We had a freak period of temperatures in the low ‘teens around our first frost, so I set up a makeshift cover, made of buckets on top of T-posts, and double-covered with Agribon. This saved a ton of blooms, but those near the doors and exhaust fans did get frost damage and had to be tossed. I pinched hard when they went in the ground, and again at the end of July. I did not disbud, but still had large beautiful blooms. I’d love to do an experiment on disbudding vs. not, to see what flowers and production look like in both scenarios. Alexis: A true blushy pink with glorious size & form. Apricot Alexis: Thoroughly beautiful, coppery/peachy/orangey blooms lightly streaked with gold and purple. Lavender Pixie: An adorable lil pink pom that was VERY floriferous. Obsession: Might be my favorite that I grew this year – shorter, with truly lavender blooms darkening to plum in the center. Elegant and outstanding. Seaton’s J’Adore: The perfect color of blush, BIG lovey blooms. Seaton’s Ruby: Still a fave. They are a really lovely burgundy-rust, with intriguing gold edging on the tips of the petals. Shock: Can you say MAGENTA. Such a cute little form, brilliant, unexpected color for the season, and super productive. ‘Lavender Pixie’ - yes, really much more pink than lavender. (Bronze Fleece, Peter Magnus, Megumi, Rose Maiko, and Pink Fleece are in the “Cascade” category, but still looked good grown normally). It’s often hard to tell what the real color is from these UK pics, due to different lighting and the weirdness that happens to a flower when you disbud, which is part of why I now want to grow every single one, just to get a good pic! If you are blessed with those legendary thousands of hoop houses, you may be able to leave your mums in the ground over the winter, just watering them every so often, and perhaps covering with frost cloth for the coldest times. I certainly had mums reappear in the spring. However, with limited indoor space, I have to turn my mum beds over for ranunculus and anemone plantings, so I dig them up and store them dry in the cooler, like dahlia tubers. Yes, you can store them. They cannot completely dry out like a geranium, but very close to that. The best thing to do is to dig them after they have bloomed and died back. A frost will ruin the blooms and should kill the plants, but not all the way to the roots. You should be ok in the hoop house for some time, I would imagine, but try to let the plants die naturally as long as you are not expecting anything drastic. After that, cut the stems back - you can leave a few inches - and lift the root system. They need to be kept cool and dry, as best you can, but above freezing at all times. They can be stored in crates and covered with perlite or straw, or even put in cardboard boxes. The trick is to keep them just moist enough to survive, but not wet where they rot. Ridiculous bounty in July. Top row, left to right: ‘Salmon Rose’, ‘Coral’, ‘Deep Red’ and ‘Uproar Rose’. Bottom row, left to right: Benary’s ‘White’, ‘Bright Pink’ and ‘Purple,’ ‘Queen Red Lime’ and ‘Queen Lime Blush/Blotch’. I know, zinnias may not be the star of the show, but they are true workhorses that deserve their time in the spotlight. One thing I learned this year: zinnias don’t like to be grown in landscaping fabric. They did just as well without it, and seemed to have fewer issues with leaf spots and other diseases. I think they really like dry feet. Benary’s Giant Salmon: This is my favorite zinnia of all time. The best color, not too bright and not too muted, with strong, long stems, big flowers, and excellent productivity. I need whole beds of it. Benary’s Giant Deep Red: I’ve decided I like this color much more than the ‘Wine’, though that has its place too. Deep Red is much more effective as a burgundy, which so many wedding palettes require. Oklahoma Golden Yellow: This gem is a truly perfect color, and it has such well-formed blooms that I just couldn’t stop cutting it. Along with its sibling ‘Oklahoma White’, it’s my favorite smaller zinnia. Ok, I like the little ‘Sunbow’ and ‘Lilliput’ mixes too. Queen Red Lime: This year, she finally worked out for us. This variety needs a bit of time before it starts producing long stems, but it’s worth the wait for the unique, perfect color, a sort of maroon-green-mauve. The only advice I can give for this one is to just plant more. Queen Lime Orange: This variety performed poorly for us this year, but I think it was in a weird spot in the field. The blooms were really perfect and lovely, with a gradient from bright orange to peach to green in the center, and I thought it was absolutely magical. Unfortunately it was pretty short, and I think had some malnourishment going on. 10/10 would try again. I’ve also grown the Candy Mix, Cupcakes Series, Zinderella Peach, Zinderella Lilac, and other crested forms, without much success. All these seem to produce the double crested forms at a very low rate, maybe 30% of plants. And it does seem to be individual plants that throw the double crested blooms, so it seems to be a genetic trait, as well as a trait affected by climate. 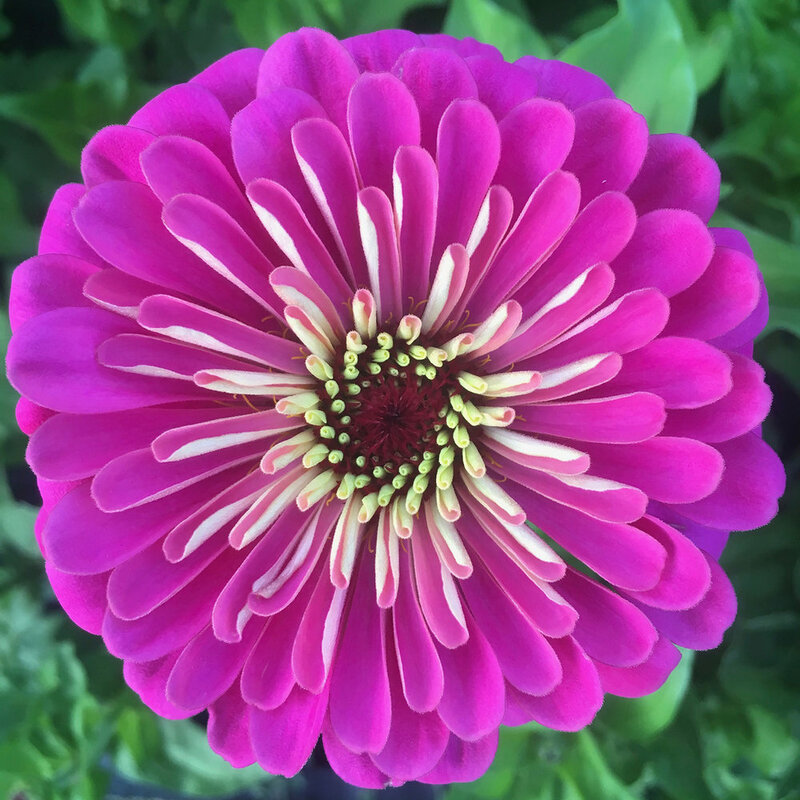 In a new blog, Floret reports breeders saying that plants will throw single blooms if they experience any stress at all; it seems like some individuals are more stress-proof than others. I’m intrigued by the new series that GeoSeed and others are offering, called ‘Cresto’, which promises 75% double blooms, and of course by the new colors in the ‘Zinderella’ Series. Another variety I’ll be dropping from the rolls is Queen Lime Blotch/Blush. I just don’t love the color and the blooms are often single. Bright zinnias in one of our weddings’ lush head table garland. Image ©Callie Hobbs. ‘Uproar Rose’ - yes, they’re bright! I hope you enjoyed this roundup of 2018 focal flowers. I’d love to hear from you about anything you loved growing this year, or anything that just wasn’t worth your time, and why. Please ask questions so I can clarify anything I wrote, or point you toward more resources on growing these beauts. Next week I’ll be focusing on the secondary flowers, weirdos, and foliage that I loved from 2018. Thank you! I’m so happy you want to keep in touch.